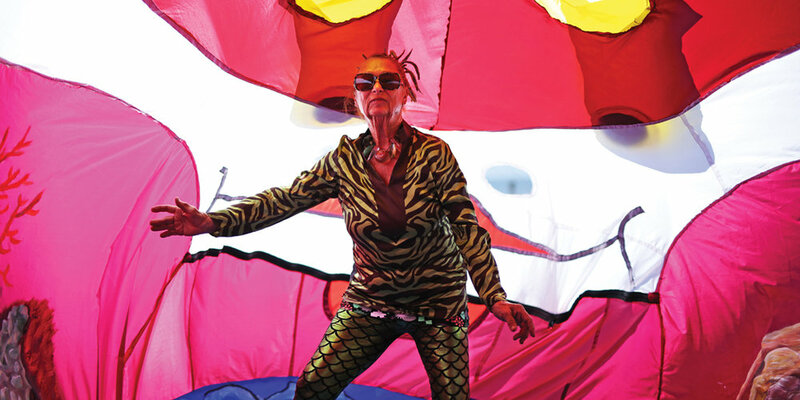 Creatrix of the Nylon Zoo Story Theatres, Evelyn Roth is an internationally renowned textile and performance artist, specialising in environmentally sensitive storytelling at festivals, family and community events and schools. For over four decades her work been seen at major festivals, expos and galleries worldwide, including Brazil, Hong Kong, Korea, Japan, the United States, Canada, South Africa, New Zealand and Australia. Throughout her long career Evelyn has received numerous awards for her pioneering work as an artist activist and for her innovative recycled creations. Her NYLON ZOO story theatres, bringing enchantment and delight to thousands of people, were created to raise public awareness about threats to the environment and to many of the worlds endangered species. Evelyn Roth is a self taught internationally renowned community artist. From Vancouver to Maslin's Beach Australia and everywhere in between, her extraordinary career has empowered children and communities worldwide to take action on environmental issues in fun, artistic and engaging ways. The NYLON ZOO is a choreographed participatory event - you are the dancers and performers! Evelyn's Nylon Zoo features annually at Womadelaide festival, as well as community events, schools, and arts festivals. The Zoo is available for hire, complete with Evelyn's hand-picked storytellers. Evelyn's hand crafted Nylon Zoo tours as a virtual air sculpted classroom. The 45 minute program features a participatory costume parade before gathering the children inside giant inflatable multi-coloured creatures for storytelling. Each piece is painted by Evelyn's artist husband John Davis, and carries through an eco theme, such as the Coral Reef. Evelyn's programs tour hundreds of Hawaiian schools annually, and have been an iconic feature at Womadelaide Festival for two decades. Sign up with your email address to receive news and updates on Evelyn's new works, festival tours and exhibitions. Evelyn featured in a National Geographic documentary talking about her passion for festival arts and educating the public about the environment. A short movie featuring the amazing Evelyn Roth Nylon Zoo and Mazes, including a children's costume parade filmed at Womadelaide. A kaleidoscope of colour.